One of the startling things about the metal finishing industry is that it uses chemicals like sulfuric acid and cyanide to turn raw parts into things of beauty. Boxes and bins of parts, smooth, shiny, maybe brightly colored, all go out into the world to do their job. At F.M. Callahan & Son, a Malden, MA, metal finisher, out of the bubbling, steaming liquids come tiny golden electrical contacts and big sections of jet engine housings, red knobs and green brackets, and tin-plated parts by the thousand. Some think that plating is a black art and plating shops are like dungeons, dark, dank and damp. Not necessarily. Instrumentation and chemical analysis make the process quite scientific, and good lighting and ventilation make the plating shop look, feel and smell like any other factory floor. Customers can choose from many different metal finishing processes. Which ones they select will depend on the challenges they expect any given part to encounter during its working life. Different finishes offer combinations of corrosion resistance, wear resistance, solderability, optimum electrical contact and attractive appearance. Plating is a layer of metal so tightly adhered to a surface that it becomes part of that surface. 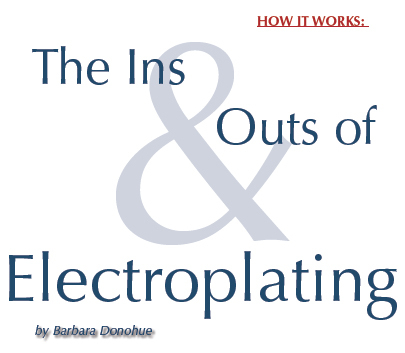 Electroplating uses electric current to inspire atoms of metal to deposit on the part being plated. Most electroplating shops also offer other surface finishes as well. Anodizing imparts to aluminum pieces a hard oxide coating that may be colored to order. Chromating produces an attractive, corrosion-resistant surface that gives excellent paint adhesion. Passivating uses acid to remove iron from the surface of stainless steel parts. Electroless nickel plating, as the name implies, plates nickel onto a surface, but does not require electrical intervention—the part is immersed in a hot bath of chemicals and comes out coated with a uniform layer of nickel, hard and shiny. Electroplating can be done using many different metals as the plating material, including tin, nickel, copper, zinc, gold, silver, chromium, lead and various alloys. To electroplate a part, it must be immersed in a tank of water with a chemical that contains the metal to be plated. If the plating material is copper, this chemical might be copper sulfate. This supplies the charged metal atoms called “ions” that make electroplating possible. The water bath also includes other chemicals that aid the process. At the same time, a piece of the plating metal, copper in this example must also be immersed in the tank. As plating occurs, this will replenish the metal ions in the solution. The copper ions in the solution have a positive charge, so they are attracted to the negatively charged part and “stick” to its surface. This depletes copper ions from the solution, but at the same time, copper ions enter the solution from the positively charged piece of copper. This process continues as long as power is applied. The longer the process continues, the thicker the plating will be. This is a simplified explanation of the plating process. In a plating plant, the process has more steps. The temperature, current flow and other factors must be carefully controlled. Any dirt or grease on the surface of a piece will prevent it from plating properly, so thorough cleaning is critical to the plating process. Solvents were once widely used for cleaning, but with today’s stringent environmental regulations, water-based cleaners do the job. Electrocleaning, which is something like “reverse plating,” also helps to remove any dirt and prepare the surface for plating. Each plating shop offers its own range of processes and can handle different types of parts. In addition to electroplating, F.M. Callahan offers many other surface finishes, and can apply them to parts from the size of pin heads to those weighing two tons. In one day, the products coming off the lines might include spacers, bolts, brackets, heat sinks for braking systems used on trains, silver-plated filters for cell phone systems, anodized components for optics, sections of jet engine casings, and many kinds of gold- or tin-plated electrical contacts. Large parts require large tanks and electric hoists to move the parts in and out of the baths. Moderatesized parts are placed on racks that provide both easy handling and electrical contact. Barrel plating works for many small parts that cannot economically be placed on racks. In this process, the parts are placed in a perforated plastic cylinder, or barrel. The barrel rotates slowly, perhaps 12 RPM, while immersed in each bath. Flexible electrodes inside the barrel provide the negative charge required. The parts themselves provide electrical contact with each other. Very small parts, those too small or delicate for barrel plating, may be plated in a vibratory basket. This provides electrical contact and uses vibration to gently circulate liquids over the parts. Plating specifications may range from a few ten-millionths of an inch for gold plate on small electrical contacts to a couple of thousandths for non-precious metals on large parts. The thickness of an electroplated finish may be different on different areas of the same part, depending on the geometry. Internal surfaces plate less readily than external surfaces, for example. How much does electroplating cost? Pricing depends on a number of factors, including which plating process and material are used, how much area is to be plated to what thickness, plus any special masking, handling or cleaning requirements. Eric Jacklin, president of F.M. Callahan, offered some ballpark pricing for plating different kinds of parts. Plating small electrical contacts with gold might cost $30 to $50 per thousand. Barrel plating other small parts might cost pennies per pound. Tin plating inch wide heavy-duty electrical contacts on racks could cost 25 cents each. A section of jet engine casing costs $20 to plate with sulfamate nickel, a soft finish used for parts that will be welded. For many parts, plating is the last production step. The parts cannot be delivered and nobody gets paid until the plating is done. So customers are often in a hurry, and turnaround time can be critical. Jacklin says normal turnaround is usually three to five days. Customers often need rush jobs, and quality control manager Kevin Reynolds says it is possible to receive the parts in the morning and send them out in the afternoon. In general, the most important job of a plater is to produce consistently good parts from batch to batch. This requires careful control of all the different factors that affect the plating process. Look for a plater who uses an on-site laboratory for monitoring the different chemical solutions. Ask about established inspection procedures and equipment such as x-ray thickness measurement systems. If there is a problem, how responsive will this plater be? Is the plater attentive to safety? Does the plant have hazardous materials under control and use an effective wastewater treatment process? Is the plater certified by some standard such as ISO 9000 or the National Aerospace and Defense Contractor Accreditation Program (NADCAP)? These standards indicate that the shop follows documented procedures to produce consistent plating on parts. Some commercial customers may require ISO 9000 and many aerospace customers require NADCAP. Does the plater keep careful records? For aerospace parts, the paper trail may have to be very detailed, and the plater must keep the records for up to 30 years. As the customer of a plating house, it is important to keep in mind the needs of the plating process. For example, arts need to be absolutely clean before plating and finishing. A change of cutting fluid in the machine shop could spell trouble on the plating line. The new fluid might seem just like the old fluid, but it could require a different cleaning process at the plater. Always notify the plating house of any change in cutting fluid, oil or other chemicals, advises Reynolds. Many years ago, platers did not have to worry about what they did with their rinse water, plating baths, acids or any other material. In the 1970s, environmental agencies started enforcing regulations for what can and cannot be done with these chemicals. Plating houses in the U.S. must now treat their wastewater to remove the harmful materials. This can be expensive, but must be done. Platers that do not comply with environmental regulations risk being shut down. When racks or barrels of parts are moved from one bath to the next, cleaning solutions, rinse water and plating solutions drip down into floor drains. This mixture of fluids usually makes up most of a plant’s wastewater. At F.M. Callahan, it is first treated to make the dissolved metals precipitate out of solution. Then most of the water is removed by ultra-filtration. Finally, the resulting sludge is dried and shipped to a company that handles recycling and disposal. The water coming out of some treatment systems is as clean as tap water, so some plating plants reuse their treated wastewater. These “zero discharge” systems can be cost effective in places where water and sewer costs are high.